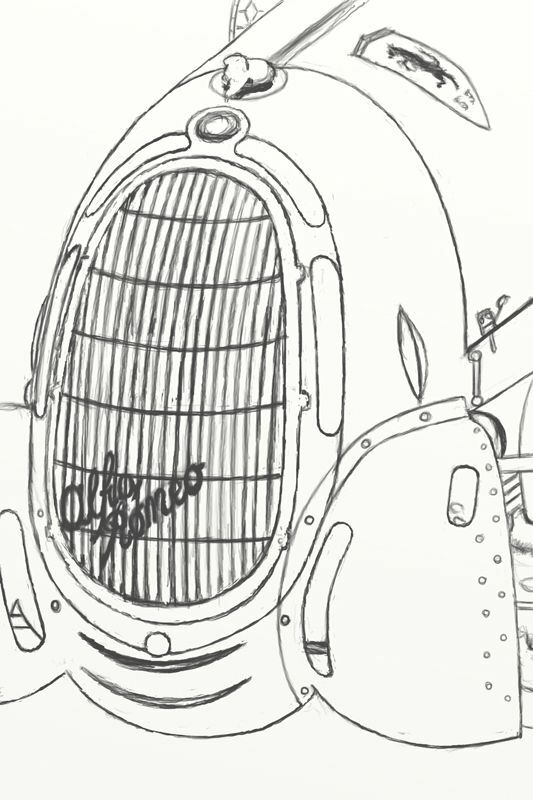 Starting a third Alfa Romeo painting, this time it's a classic grand prix car, the Alfa Romeo 8C 35. I'm working from some pictures that i took at a vintage racing event. I like the shapes and the inclusion of the emblems of Alfa Romeo itself and Scuderia Ferrari, which was the Alfa factory racing team at the time. 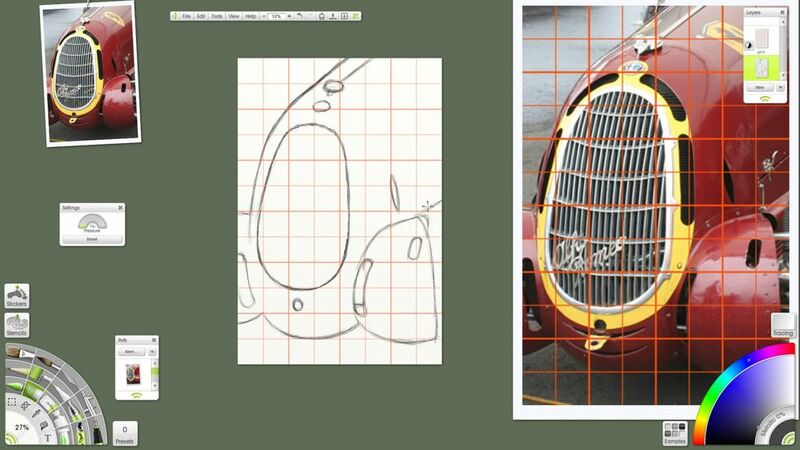 I'm using grids again to get the shapes laid in and correcting as I paint. Oooh, I am excited to see how this will turn out! That is a beautiful reference photo, and a beautiful car! Look forward to following the progression, I learn so much from watching others work. Thanks scribbledsoul, it is a beautiful car. I've got a video of it here: http://youtu.be/mGg7JgIqprU . Thanks limey-g, I hope I don't give you a bum steer . The rough sketch is done and painting can begin. I'll refine details during painting. I may leave the bit of rear tire out of the painting, we'll see if it adds anything. How did you get the original image with the grid lines on it? I think this is a good way for someone like myself who is in the novice category to learn how to draw from real life images. I look forward to seeing more of this as you progress. I like to try to learn from people like you. Your paintings are just wonderful. I love how you are showing the in-between steps. It allows all of us learn something about how your paintings develop. I'm not sure how felixdk put the grid on the reference image, but since you asked, I wrote up a short tutorial on how to do this. Click on the URL below. Hi hanzz, I have high hopes for this one, the shapes and details on some of these art deco 30s cars are truly beautiful. dcahall, glad to help you if I can. I actually have various grids that I've used in previous projects in Photoshop, so I am able to tailor them to suit, apply the grid to the reference image and import them as .psd to a layer in the painting. I wasn't aware of the script that fugu-guy uses, but it looks like the best way to do it in ArtRage. fugu-guy, thanks for the tip and the praise. I'm always happy to show my methods. Every time I work on a new painting, it seems like I learn something.